EucoLight, the European Association for lighting WEEE compliance schemes, has conducted a multinational consumer survey. The survey concluded that many consumers were unable to distinguish between different lamp types. The results reveal that citizens from the six countries surveyed were not sure how to distinguish between energy-saving, LED, incandescent and halogen lamps when shown images of the lamps. The findings were very similar in all the countries surveyed. In the case of energy-saving lamps, between 27% and 42% of respondents identified them correctly, as opposed to 18%-35% who confused them with LED bulbs. When asked to identify an LED lamp, only between 14% and 23% of respondents classified it correctly, whereas between 31% and 45% thought it was an energy-saving light bulb. Recolight CEO Nigel Harvey, who is also a Director of EucoLight said “These findings mirror the situation in the UK. Most consumers have difficulty in differentiating different lamp types. That is why it is logical for all waste lamps to be collected in the same container”. Respondents were also asked if they know where they should deposit lamps for recycling. Spanish and Belgian citizens scored highest, with around 50% suggesting local authority waste facilities or recycling plant, and more than 10% suggesting the retail outlet where they purchase their lamps. GFK, the leading market research institute carried out the survey on behalf of EucoLight between March to May 2017. In Spain, Portugal, Italy, the Netherlands and Belgium 1000 consumers aged 18-65 responded to an online questionnaire and a face to face survey was conducted in Romania. Recolight’s comprehensive offering makes it the preferred WEEE scheme for the lighting industry, setting the standard for the sector. 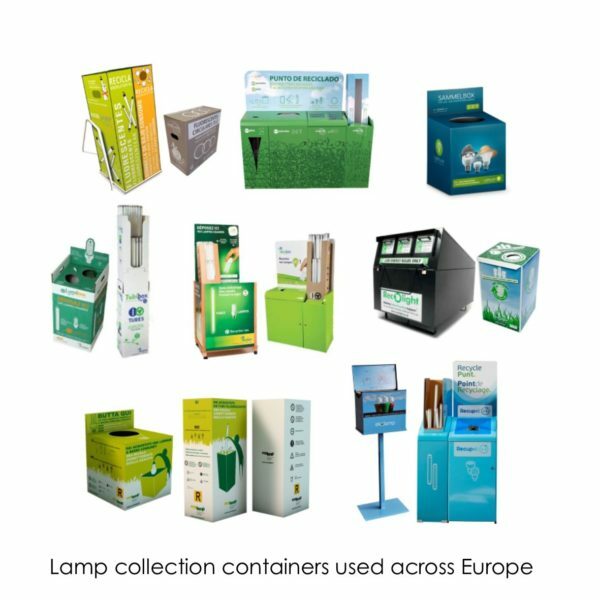 It is the only WEEE compliance scheme in the UK to provide integrated Lamp and Luminaire collection and recycling. It has the biggest UK-wide network of over 3000 collection points. As a result, since its founding in 2007, Recolight has funded the recycling of over 280 million lamps, LEDs and luminaires, more than all other UK WEEE schemes put together. EucoLight is the European Association focusing on lighting WEEE compliance schemes that fulfil Extended Producer Responsibility. EucoLight engages with everything related to the WEEE Directive, legislation and standards affecting the collection and recycling of WEEE lighting; working on behalf of its 19 members. EucoLight members collect and recycle in total 79% of lighting waste in the 18 countries where the association is present. EucoLight is the voice of European WEEE Producer Compliance Schemes specialised in managing the collection and recycling of WEEE lighting; working to make the circular economy a reality for lighting products. Founded in mid 2015, EucoLight engages in a constructive dialogue with stakeholders to provide expertise in the field of the collection and recycling of WEEE lighting and promoting the positive role of Extended Producer Responsibility schemes for WEEE lighting on the environment and society. More information is available on EucoLight’s website at www.eucolight.org, following EucoLight on Twitter @EucoLight or contacting the Secretary General, Marc Guiraud (marc.guiraud@eucolight.org).